Artificial intelligence can significantly improve a contact center's business performance. Afiniti is one of the companies leading the way in applying artificial intelligence (AI) and machine learning technology to the contact center. The company has developed AI-based technology that pairs contact center agents with customers to help measurably improve contact center business performance. Afiniti is a partner in Avaya's A.I.Connect initiative, but the company's solutions work with any contact center or telephony switch. Afiniti is a passionate believer that the contact center should be in the service of an organization's bottom line. The core function of pairing customers to agents should support this premise by routing customers to the agents most likely to achieve the desired outcome, whether it be new sales, upselling, retention, or problem resolution. The company's AI algorithms enable intelligent routing for the optimization of any of these desired outcomes. The idea of pairing the agents most likely to achieve a desired outcome with customers is not a new concept; tracking and monitoring agent performance is standard contact center procedure. What's unique about Afiniti's approach is how it improves the overall performance of the entire contact center, not just high performers. Plus, its effectiveness can be accurately measured. Afiniti is so confident of its technology that it is willing to install its solutions risk free and at no cost to the customer, taking payment based on actual performance improvements. Afiniti's technology uses several supervised machine learning techniques, including regression and classification analysis along with Bayesian analytics and heuristics. Using regression analysis, Afiniti's system matches customer characteristics and behavior with complementary agent characteristics and performance to estimate a probability of how likely a particular agent will achieve the desired business outcome with a particular customer. While this sounds simple and straightforward, it's really quite complex. The graphic below shows a simplistic overview of the logic flow when pairing agents with customers. Afiniti's "customer agent" pairing algorithm uses AI machine learning to optimize contact center performance. It all starts with a customer's automatic number identification or caller ID from the IVR system. Using the customer's phone number as an initial data key, Afiniti's system begins accessing information from more than 100 public and private data sources using a data-chaining mechanism. For example, from the phone number, Afiniti can find out a person's name, street address, city, and state. From this location information, the company can access census data to determine characteristics of the person's neighborhood, city, or town. It can then pull down an individual's data from credit reporting bureaus, companies that track online user behavior, social networking sites, and even organizations that track purchasing information. All of this customer attribute data feeds into a neural network to compute customer types or customer segmentations, a process that is accomplished in a matter of microseconds. Companies that use Afiniti's system will normally have a small number of customer types, each of which may be further segmented into subtypes. Having more than 100 different customer subtypes within one queue isn't unusual for a company. We should note many end user organizations already have their own customer segmentation schemes. Afiniti will use an organization's own segmentation types as inputs to the neural network, along with all of the other data Afiniti gathers about a particular customer to generate a unique Afiniti segmentation. The process of matching an agent with a customer is done by a machine learning technique called regression analysis. The Afiniti system feeds the regression algorithm with data attributes from both the customer and the agents currently on duty. Customer data includes the customer type along with any other existing data from the CRM database. IVR digits and queue data play into the analysis as well, because they provide information on customer intent -- the reasons for their calls. Do they want to buy something or speak with tech support, for example, or do they have a request to discontinue service? Agent attributes, including performance, also feed into the regression model. Other attributes the model uses are based on an optional 20-minute survey administered to new contact center agents or upon initial deployment of the Afiniti solution. These other attributes can include a wide variety of factors such as likes/dislikes, married/single, male/female, children/no children, hobbies/interests, athletic or not, music interests, sports interests, and where they live. 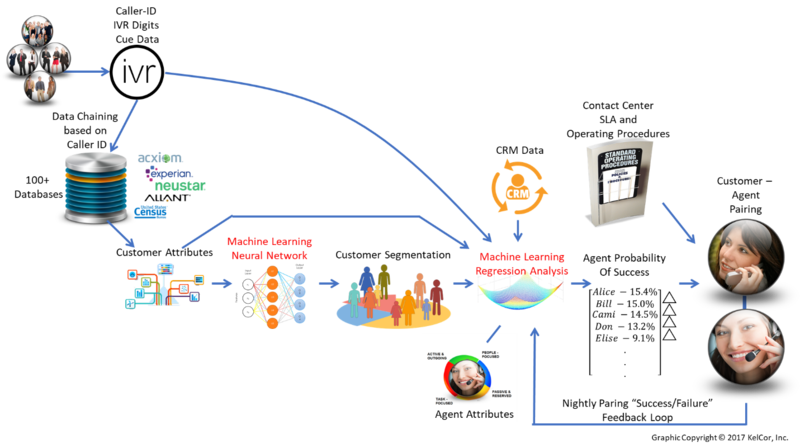 Based on the customer and agent data, the Afiniti software uses the AI regression model parameters to compute how likely a particular agent is to meet the business objective (sell, subscribe, upsell, retain, etc.) successfully. These computed agent probabilities are compared to one another in terms of the differences between them (this is represented by the ∆s [deltas] in the graphic). Finally, based on contact center service level commitments and operating rules, the Afiniti software makes an optimal agent pairing. It follows all contact center rules in doing so: length of time in queue, equal call distribution among agents, etc. Importantly, Afiniti's solution works within the constraints of the contact center's operating rules, and it doesn't necessarily favor one agent over another. In the high-volume contact centers where Afiniti operates, every agent is purposed where he or she can best satisfy the company's business objectives. And, because of how Afiniti measures its own performance, every agent is treated fairly.